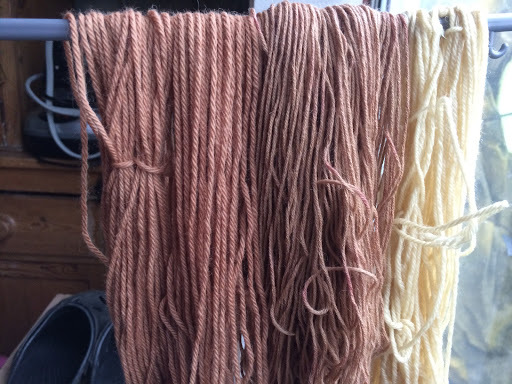 So last week, having visited the Ethel Mairet archive at Ditchling Museum and been entranced by the naturally dyed yarns, plus talking to my students about natural dyeing, (which fits in nicely with the hand knit and hand spinning I am teaching a the moment), a.bit of wet work seemed just right. 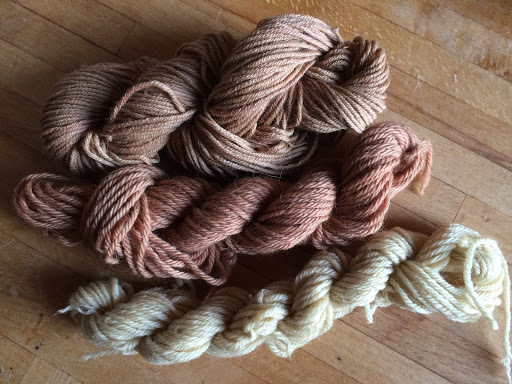 To start with I dug out some ecru and natural yarns – one is alpaca and merino, and the other two are merino, all double knit weight. Only small, odd balls to play with as this is just fun. 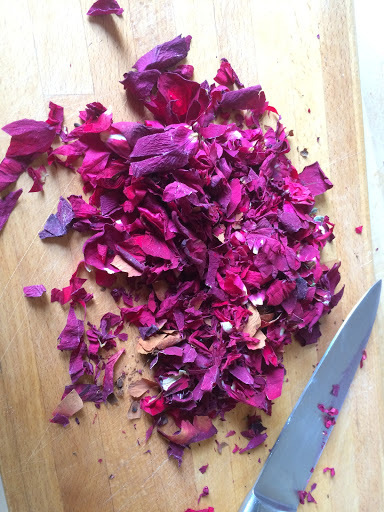 First I chopped the heads up finely – this is to release the most colour potential. 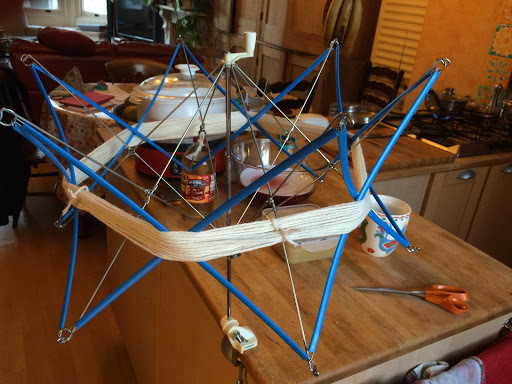 Whilst the petals were simmering I had taken my yarns and wound them into hanks on a niddly-noddy – I would love a wooden one, but this rather ghastly plastic one works fine. 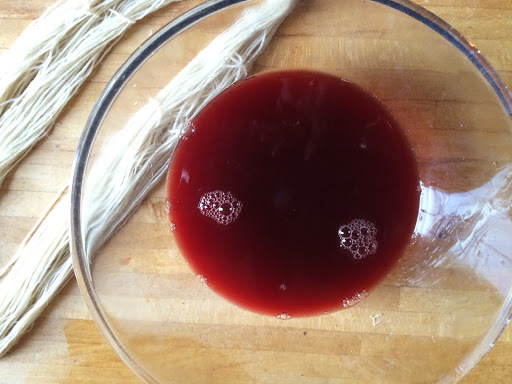 Actually I think I might have a wooden one somewhere… must look through my cupboards. 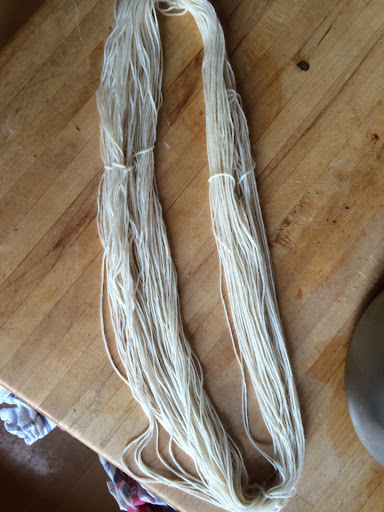 Whilst hanking the yarns I inserted ‘leases’ at intevals around the hank (3 on this small hank). 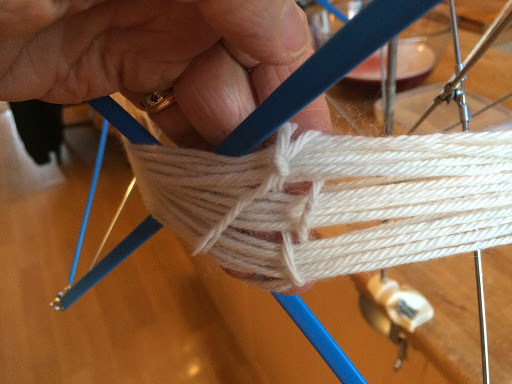 These prevent the yarn tangling during the dyeing process and make it easy to back wind into balls afterwards. 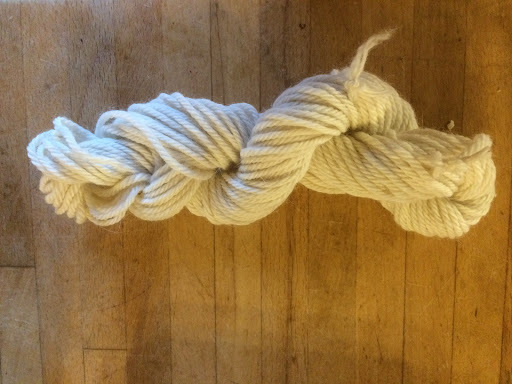 I do love the look of a hank twisted up tidily. 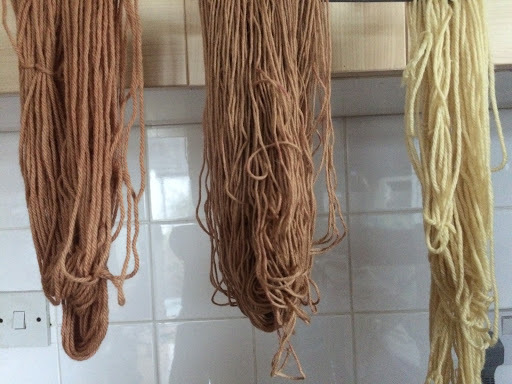 The hanks of yarn were then immersed in the vinegar mordant solution, (I used 3 parts water to 1 part vinegar). 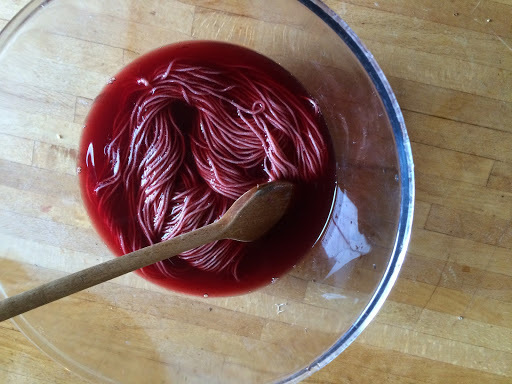 They were simmered in it for about an hour, and then left in a glass bowl until the liquid was cool. 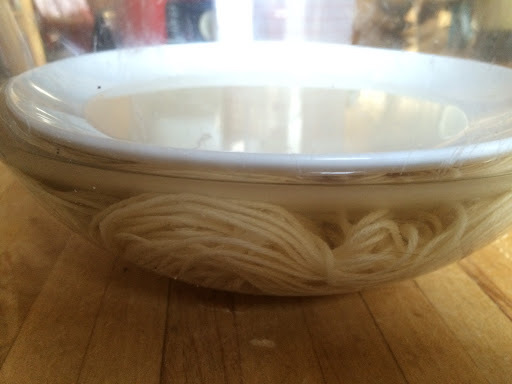 A plate on top kept them submerged. 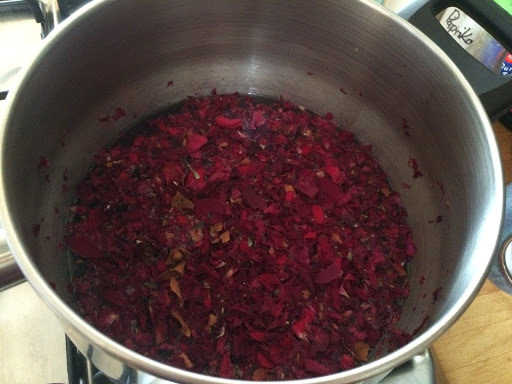 When they were ready, I took the hanks out of the mordant, drained them, and immersed the first one in the rose dye into which I had added a tsp of lemon juice as some people say this helps deepen the colour. 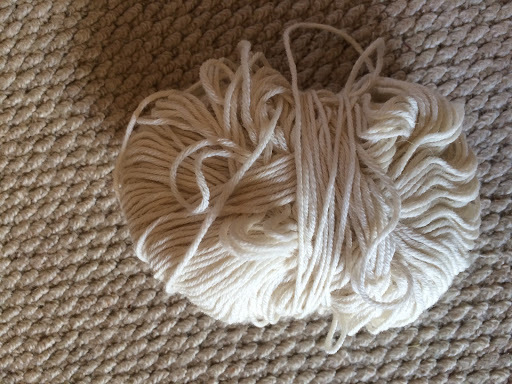 However, this is where I believe I went wrong. 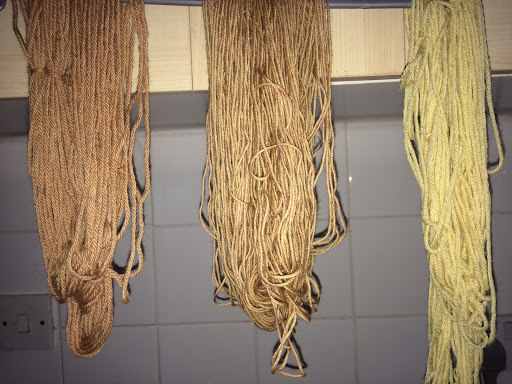 I had added salt when preparing it to help the dye stick, but I think I should have simmered the yarn in the dye at this stage, because the colour washed out even after an overnight soak. 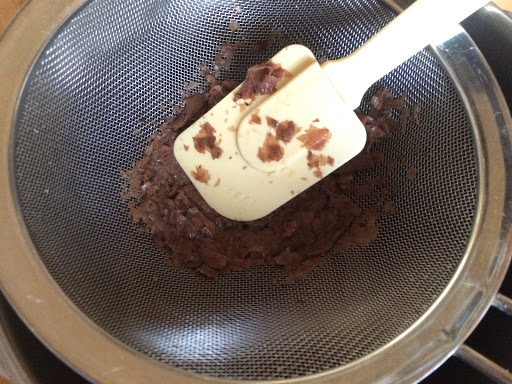 I did re-boil and simmer the next day but the lovely pink colour never returned, it went brownish. 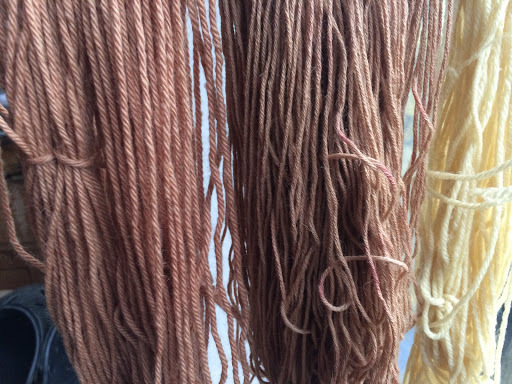 Not unattractive, but not the lovely pink it had promised after the first dyeing! 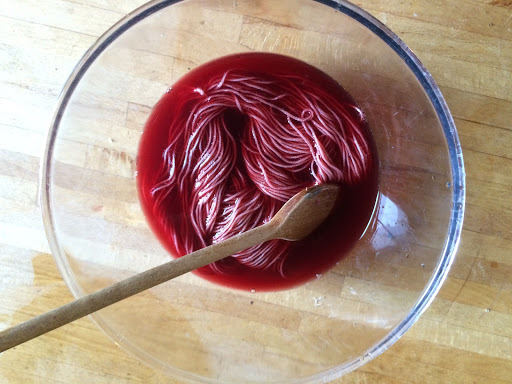 Not being put off I then dyed one hand in the orange peel bath and the other in the red onion skin one. 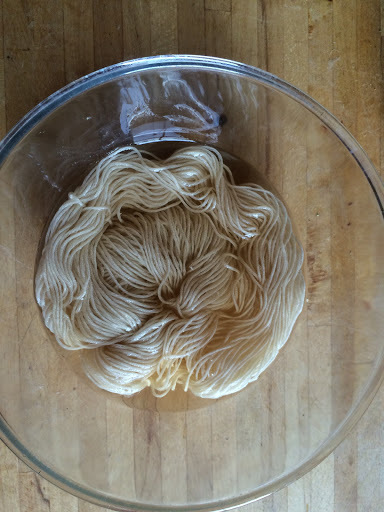 I used only salt on the onion yarn. 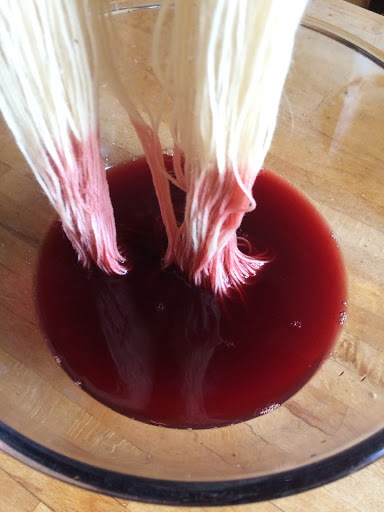 As with the rose version, I simmered it in a salt water solution and added salt to the dye bath as well and then simmered the yarn in that for an hour. 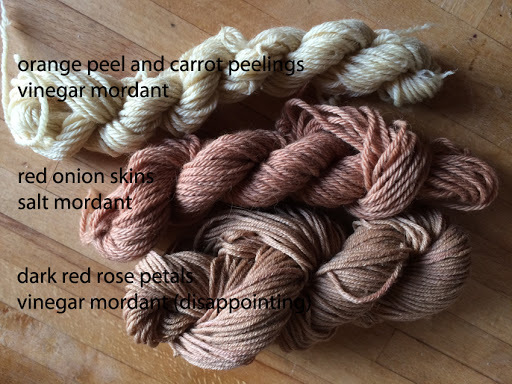 The orange peel and carrot yarn was mordanted in vinegar as the rose yarn had been, salt was added to the dye bath and the yarn simmered in the dye for an hour.